Journalists at the Chicago Tribune say they want to unionize to secure better pay and resources to fulfill their mission. One of the nation's oldest and most prestigious regional newspapers, The Chicago Tribune, could soon have a unionized staff. On Wednesday morning, journalists from its newsroom informed management that they are preparing to organize and that they have collected signatures from dozens of colleagues. This is a historic move at a paper that, for decades, had taken a hard-line stance against unions. The move is unlikely to go over well with corporate owner Tronc. Two months ago, the newspaper publishing company struck a deal to sell another venerable daily, the Los Angeles Times, weeks after the paper's journalists succeeded in unionizing its newsroom. 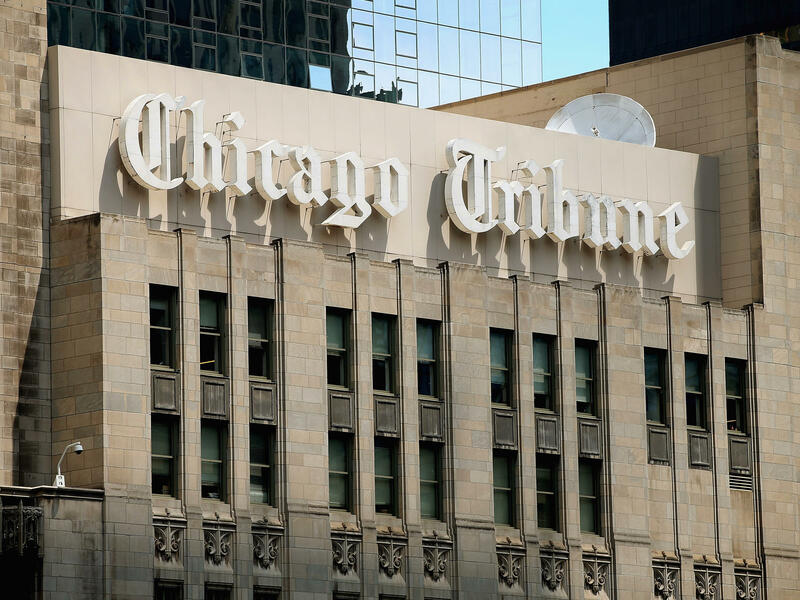 Journalists at the Tribune say the move will help them secure better pay and ensure they can fulfill the paper's mission. "For a long time, we didn't think we needed it," said Charlie J. Johnson, a Tribune home page editor who has been helping to lead the union drive. "The pay and the prestige was more than people working in union shops. That's no longer the case. And it hasn't been in a while." Later on Wednesday, editor and publisher Bruce Dold sent a note to staff striking a respectful tone. "We believe in transparency, open dialogue and fairness. That's who we are as journalists and what guides the Tribune," Dold wrote. "The letter raises concerns about compensation, the cost of health care benefits, development opportunities, staff diversity, job security and other issues. We take all of these to heart." Dold also said the Tribune wanted to remain competitive, offer merit pay and also promote gender parity and a more diverse work force. The newsroom's effort flies in the face of the paper's anti-union traditions. In his definitive treatment of legendary Tribune Publisher Robert McCormick, biographer Richard Norton Smith wrote of his distrust and aversion to unions. That antipathy has lived on, a century later, in the paper's typically labor-skeptic line on its editorial page and in the clear wishes of the Tribune Co.'s publishing successor, Tronc. Journalists cited a basket of concerns: fears of job security after two rounds of layoffs in the past six months; irregular and scant raises; rising health care costs; and a desire for more generous family leave conditions. They also worried about Tronc's commitment to the newsroom's mission, including concerns about journalistic independence, resources to staff the paper adequately, and the executives' own practice of assigning generous compensation for themselves. "They have looted the company, and the Tronc executives have paid themselves outsized salaries," Johnson said. "The motivation [for unionizing] was the idea that the newsroom would finally have a voice and say in how things operated. We wanted a microphone to speak to management and the public about how this place should operate." In a note circulated to colleagues, the organizers also wrote that the newsroom staff didn't reflect the diversity of its region. The organizers also want to secure data to determine whether the newsroom pay was equitable. In a similar analysis of newsroom pay released Wednesday, the newly-formed LA Times Guild found significant disparities along racial and gender lines: For instance, it found that white men earned on average $30,000 more than non-white women. When the union effort gathered steam at the LA Times several months ago, Tronc announced it would give raises to many of its journalists. The company also circulated memos arguing against the adoption of the Newspaper Guild. The Los Angeles newsroom voted in early January, and the tally took place on Jan. 19. The margin in favor was overwhelming. Tronc's controlling owner, Michael Ferro, receives $5 million a year as a consulting fee, a payment that created shock waves in his company's newsrooms when it surfaced in publicly available disclosure forms. That fee remains even though he stepped down as board chairman last month after two women with whom he came into contact professionally accused him of sexual harassment. In another instance, the CEO of Tronc's new digital division, Ross Levinsohn, was paid $6.9 million in compensation in 2017. He had worked for the company as publisher of the LA Times for just a bit more than four months last year (and was also paid $300,000 as a consultant earlier in the year). Levinsohn stepped aside as publisher in January after NPR reported on past allegations of workplace misconduct. The Tronc board exonerated him, without releasing the reasons, and named him the head of the digital division on the same day it announced it had reached a deal to sell the LA Times. Other top executives were also paid millions. Corporate officials warned investors they could not offer a financial forecast for the company because of its unclear future without the LA Times (and its sister paper, the San Diego Union-Tribune). Founded in 1847, the Chicago Tribune has been the city's leading newspaper, boasting national influence. Columnist Heidi Stevens remembers her first day at the paper in 1998: Staffers were toasting Paul Salopek, who had just won a Pulitzer Prize for his foreign coverage. Twenty years later, Stevens said, there is a very different sense in the newsroom. "In 2018, it very much feels like the very notion of a free press is under attack, from some of the statements that President Trump makes to the way newsrooms around the country are shrinking," Stevens said. "This right now feels like a really essential time to do what we can, to do everything in our power to strengthen our newsroom. "What money there is has not been spent on making the newsroom more robust as much as it has been to make our owners richer," she said. The moves at the Tribune by rank-and-file journalists are accompanied by anguished public pleas by others in leadership positions. Metro Editor Mark Jacob, a member of the news management team, recently announced he was leaving. He tweeted: "My time in the news business has convinced me that owners and managers of media companies must embrace a mission of journalism as public service, invest in their people and show bravery and independence. Our democracy depends on it." Last weekend, The Denver Post published a Sunday commentary section filled with articles taking issue with the approach of the paper's corporate owner, a New York City-based hedge fund named Alden Global Capital. Journalists argued that the company's continual cuts and quest for profits were imperiling the paper's mission and its viability. Similar themes are being sounded in Chicago. "The notion of unionization among newsroom employees is both strikingly ironic and a sign of unsettled times through the media," James Warren, a former Chicago Tribune managing editor, said in an email to NPR. Warren is now executive editor of NewsGuard, a startup that will assess the credibility of news and information websites. "McCormick, a notorious ideological foe of President Franklin Roosevelt, hated unions. And while unions did represent production employees at his flagship Chicago Tribune, they never got footing among journalists since the company melded a distinct and soothing paternalism with the pragmatism of always matching or exceeding whatever unions bargained for reporters and editors at its rival papers." The union animus surfaced twice in the 1980s, as Tribune company policies helped to inspire raucous strikes among production workers at both its flagship Chicago Tribune and The New York Daily News, its iconic tabloid. Warren covered both disputes for the Chicago Tribune and notes the company won the battle at home but lost in New York, ultimately giving that paper away to the late newspaper baron Robert Maxwell. (Tronc now owns the Daily News.) The corporate wariness toward organized labor did not recede, even if its clout ebbed. Tribune journalists were quick to say that Tronc had been preceded by waves of owners who also, in their account, had mistreated the company. Chief among them: Chicago real estate billionaire Sam Zell, who leveraged a buyout of the company with a $13 billion debt load. The company went into bankruptcy. It was controlled for a time by the company's creditors and later was taken over by Ferro, who had earlier owned the Chicago Sun-Times. "The journalists at the Tribune have a lot of sweat equity here," said Peter Nickeas, a seven-year veteran of the paper who covers gun violence. "Whoever our owners are, they need to recognize that the newsroom is a group of civic-minded people who are dedicated to their jobs." Reporters in Chicago watched closely as their peers in California battled LA Times Editor-in-Chief Lewis D'Vorkin over the independence of their news reports and the philosophy guiding future coverage. D'Vorkin was shifted out of the California newsroom. He joined Levinsohn at Tronc's digital division, which is intended to shape what its properties do online — including journalistically. A group of reporters, editors and other news professionals at the Tribune spent Tuesday night at a card-signing ceremony. NPR interviewed four Tribune journalists involved in the labor effort. They said they hope to unionize about 280 editorial nonmanagement employees at the Tribune, its sister Spanish-language daily, Hoy, the entertainment-oriented tabloid RedEye and four suburban publications. Those involved in the drive say they are confident about the ultimate success of their efforts. Among the signatories to a letter sent out Wednesday morning by organizers are some of the paper's most prominent remaining journalists, including four Pulitzer Prize winners — columnists Clarence Page and Mary Schmich, reporter Joe Mahr and photographer E. Jason Wambsgans.